The Register-Guard: Provost candidate Jorge José is excited about the university’s prospects. The Register-Guard: The dean and the chairman of UO’s Clark Honors College want to motivate young Oregonians to take advantage of what UO offers. New York Times: The NY Times ran an opinion piece by UO Professor Dan Tichenor on the topic of immigration. Portland Business Journal: UO honored its most generous donor with a courtside birthday bash and bobbleheads. Daily Emerald: For the last ten years, UO’s Center for the Advancement of Sustainable Living has been collaborating with students on building a highly sustainable home. AroundtheO: Laurenne Ross is both a UO junior and a U.S. Olympian who will be competing in alpine skiing at the 2014 Winter Olympics. Wired: A research team at UO wanted to uncover the mechanics behind the incredible regenerative properties of the vertebrates, to see if they could one day be replicated in humans. UONews: The Lillis Business Complex set the bar for sustainable buildings 10 years ago when it opened at the University of Oregon. Now microbes drawn from the dust in 155 of its rooms have provided clues that could inspire future architectural designers to encourage a healthy indoor environment. UONews: A new study finds that a dedicated team that makes decisions based on data is crucial for launching and sustaining a framework designed at the University of Oregon in the early 1990s to prevent and reduce behavioral problems in the nation's schools. 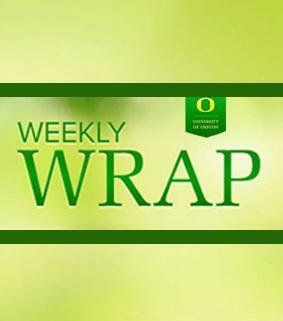 AroundtheO: The University of Oregon Libraries, Information Services and Academic Affairs joined forces to launch a pilot program fall term to evaluate the use of electronic textbooks, or e-texts, instead of traditional printed texts in university courses. AroundtheO: Geri Richmond talks about her new role with AAAS, the state of funding for basic science research and her goal to promote scientific diplomacy and education both nationally and internationally.